Investment growth of top 25 industrial houses decreased from 55.4% during 2008-09 to 19.3% during 2009-10. In absolute terms, investments by these entities steadily increased from Rs 1.70 lakh crore during 2007-08 to Rs 2.64 lakh crore during 2008-09 and further to Rs 3.15 lakh crore during 2009-10. Though the investments increased in absolute terms, if the houses investments are seen as part of their assets, the houses invested more than in the previous year in terms of investment-to-assets ratio, which increased from 28.27% in 2007-08 to 31.67% in 2008-09 and further increased to 33.95% in 2009-10. Kishor P Ostwal, CMD, CNI Research said, The investment- to-assets ratio has gone up in case of major corporates due to globalisation and overseas acquisition. Most of the investment in group companies is in their overseas subsidiaries companies. This trend will be continuing in future also. Eight of the 25 houses recorded more than 50% growth in investments over the previous year. Some examples are Mahindra, Jaiprakash Gaur and Shiv Nadar Group. The investment growth of Mahindra group companies increased from 21.1% during 2008-09 to 57.6% during 2009-10. Another nine houses namely Tata, Reliance Industries, Aditya Birla, Essar, Om Prakash Jindal, Brij Mohan Lall Munjal, UB, Murugappa and BC Jindal recorded decline in investment growth during 2009-10 from the level of 2008-09. The investment growth of the Tatas decreased from 173.3% during 2008-09 to 20.6% during 2009-10. 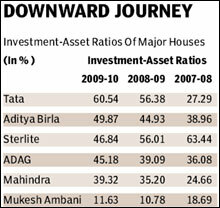 Only one house, namely the Tatas recorded an increase of more than Rs 15,000 crore in investment during 2009-10. The actual investment figure of Tata group companies was Rs 98,040 crore during 2009-10. Among the Tata group companies, the investment figure of Tata Motors increased from Rs 12,968 crore during 2008-09 to Rs 22,337 crore during 2009-10. The company has invested Rs 10,575.60 crores in equity and preference shares of TML Holdings,Singapore,which in turn prepaid the bridge loan taken for acquisition of Jaguar and Land Rover business. A steady increase in investment-to-assets ratio during last three years was seen in the case of 10 houses. Mention may be made of Tata , ADAG, Aditya Birla, Mahindra, Brij Mohan Lall Munjal, KK Birla and Godrej Group. The investment-to-assets ratio of Tata Group steadily increased from 27.29% during 2007-08 to 56.38% during 2008-09 and further increased to 60.54% during 2009-10. On the other hand a steady declining trend in the ratio was seen in the case of Sterlite, Jaiprakash Gaur, Adani and Subhash Chandra. The investment-to-assets ratio of Subhash Chandra Group decreased from 52.45% during 2007-08 to 42% during 2008-09 and further decreased to 39.58% during 2009-10. Reliance Industries showed a decline in investment-to-assets ratio to 11.63% during 2009-10 from the level of 18.69% during 2007-08. Among the top 25 industrial houses, the less than 10% investment-to-assets ratio was seen during 2009-10 in the case of Om Prakash Jindal and Shriram Thyagaraj.